There’s nothing like a fresh coat of paint to spruce up a room -- until real life resumes and the blemishes start multiplying. Scratches, nicks, scuff marks, nail holes. If only it were easy to touch up the imperfections, thought Debbie Wiener, whose two sons had a habit of dinging the walls when they tossed their shoes, bags and sports equipment. So Debbie started brainstorming with her son Sam, and they developed the Slobproof! Paint Pen. Just fill the reservoir with your paint, snap on the brush top, and start covering the marks on your walls, trim, doors and ceilings. Rinse the bristles with water, recap the pen, and store it until the next ding surfaces. 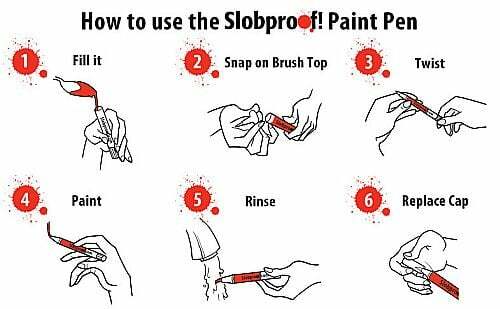 (Tip: If you fill the Slobproof! Paint Pen when you’re painting a room, you’ll have it handy when you need to do some touch-ups.) We’ve all been there. The back of a chair scrapes a wall, a vacuum cleaner collides with molding, or a filled-in nail hole leaves a mismatched patch. The Slobproof! Paint Pen makes it easy to touch up your paint job without digging through your stash of old paint cans, hoping to find a match that isn’t dried out or lumpy. Hi Daily Grommet groupies. I’m Debbie an Interior Designer, a wife of a slob, and a Mom of two boys who wreck havoc on my walls on a regular basis. 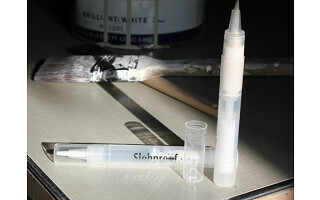 In order to keep my sanity and keep my walls looking fresh I created the Slobproof! Paint Pen. It is easy to load the pen with your own paint. Now I can touch up my walls, trim, ceiling and doors easily and keep my family! I'm wondering if you can you wash the reservoir out and use again for different paint colors? @leigh: Thanks for your comment Leigh. The paint pen isn't refillable. The pump that pushes the paint up only works one way- to keep it fully air tight. But by the time you run out of paint in the pen, years after purchase, you'll be ready to fully repaint in a new color. How do you fill the pen if the pen isn't refillable? @Christinia: Thanks for your question Christina. The pen works in one direction, so once you fill it up with paint the plunger which is at the bottom pushes the paint up towards the brush. 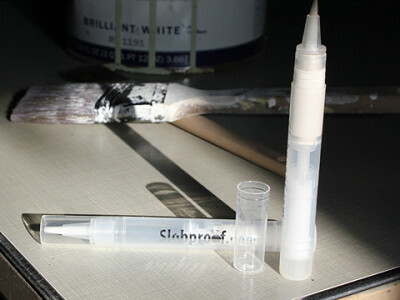 You fill the pen up with paint from the top of the pen with a plastic syringe that is provided with the pens. Then you snap the brush on. How do you fill the pen? @Kathleen: Here is a graphic of how it works. Debbie provides a syringe to fill it in Step 1. Nice idea, But they have theses in scrapooking stores. we put paint, ink ect in them. good luck. There’s nothing like a fresh coat of paint to spruce up a room -- until real life resumes and the blemishes start multiplying. Scratches, nicks, scuff marks, nail holes. If only it were easy to touch up the imperfections, thought Debbie Wiener, whose two sons had a habit of dinging the walls when they tossed their shoes, bags and sports equipment. So Debbie started brainstorming with her son Sam, and they developed the Slobproof! Paint Pen.